Summer is just around the corner... fingers crossed. 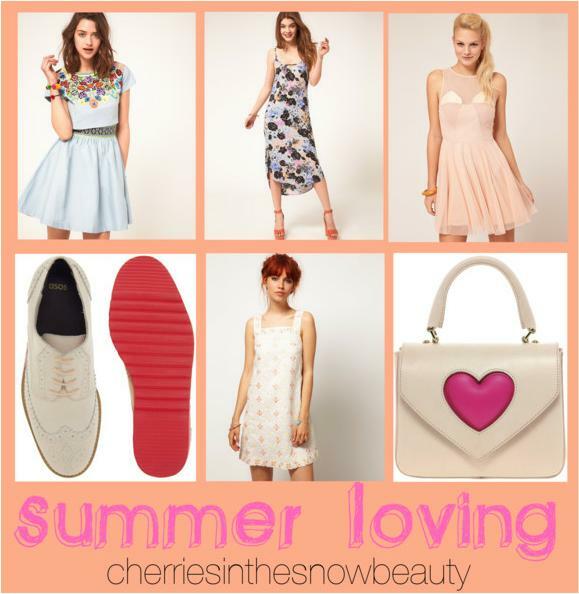 I love ditching my jumpers and jackets and swapping them for dresses and cute accessories in the summer months. Here is my summer wishlist from ASOS, the names of the pieces are click links to help you find it quicker! I adore this powder blue colour and the embroidery is really feminine and the cut out crochet detailing is really on trend. This dress ticks two trend boxes, it's both midi and floral. The loose fit and silky fabric will be great for those scorching hot days, that's if we have any! The skater dress is kitsch and cute which is the biggest trend this summer, mixing pastels with fun graphics and appliqués. These white brogues are an update on the classic brown brogues, the pink sole gives it a playful edge. I adore pinafores, think primary school chic this summer, try it with some frilly socks and a denim jacket to edge it up. Okay, I can't help but swoon over this Moschino bag, it's incredibly cute and perfect for picnics and dates. What is on your summer loving list?